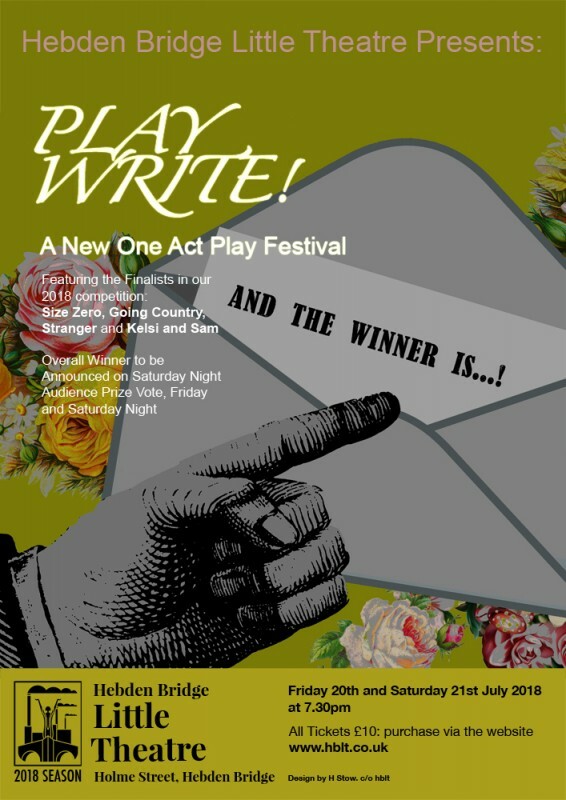 One Act Play Festival: Play Write! From an original entry of over sixty, half-hour plays, an independent panel of judges have chosen four, to be performed at the Festival, on Friday and Saturday, 20-21 July. The plays to be presented, are: Size Zero by Dave Payne, directed by Ray Riches, Stranger by Peter Bird, directed by Vaughan Leslie, Kelsi and Sam by Amelia Stephenson, directed by Jenny Gore, and Going Country by Theresa Sowerby, directed by Katrina Heath. These plays tell contemporary tales of love, obsession and alienation, that will grip and entertain the audience. The judge’s award for the overall winner of the competition will be kept under wraps till Saturday 21 July, the last night of the Festival, and there will be a vote, and a prize, for the audience favourite, each night. Tickets cost £10 and can be purchased online, by going to the website: www.hblt.co.uk. Performances commence at 7.30 pm. Join us for a feast of new writing!